Topics: Residents, Visitors, Business, Elected Officials, Services, and Departments. The estimated 6,107 daily visitors, each view 6.60 pages on average. It is written for ASP.NET language. It has 2 DNS records, ns10.embarqservices.net, and ns7.embarqservices.net. 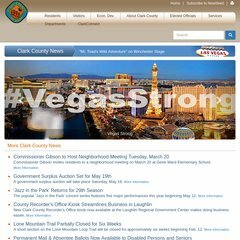 It is hosted by Clark County Nevada Nevada, using Microsoft-IIS/6 web server. PING www. (198.190.190.38) 56(84) bytes of data. Website load time is 1602 milliseconds, slower than 69% of other measured websites. As well, a ping to the server is timed at 57.2 ms.